To ensure all requests are sent and captured, clear your browser's cache before beginning a capture. To capture traffic from most browsers, enable File > Capture Traffic. Record traffic sent to http://localhost or htp://127.0.0.1 from IE. To capture traffic from Opera, start Fiddler before starting Opera. Click Tools > Options > Advanced > Network > Settings > Use System Proxy Settings. 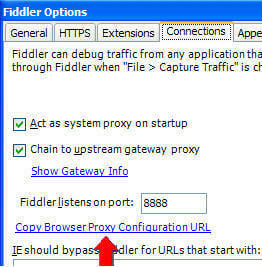 To instead allow Fiddler to automatically enable and disable the proxy, use Proxy Auto-configuration with a URL pointing to Documents/Fiddler2/Scripts/BrowserPAC.js. For example, in Firefox, click Tools > Options > Advanced > Network > Settings, and input the URL of the BrowserPAC.js. Clicking the Copy Browser Proxy Configuration URL link.